Gregory Priore, the former archivist at the Carnegie Library of Pittsburgh, after his arraignment on Friday. He told the authorities he sometimes used an X-Acto knife to remove a part of a book. A 1787 first-edition book signed by Thomas Jefferson. A version of Isaac Newton’s “Principia,” among the most influential books in science, said to be worth $900,000. The archivist who oversaw a special collection of rare books at the central library in Pittsburgh walked out of the building with these and other items — sometimes in plain sight — and sold them to a local bookstore owner, the authorities said, in a scheme that lasted nearly 20 years. 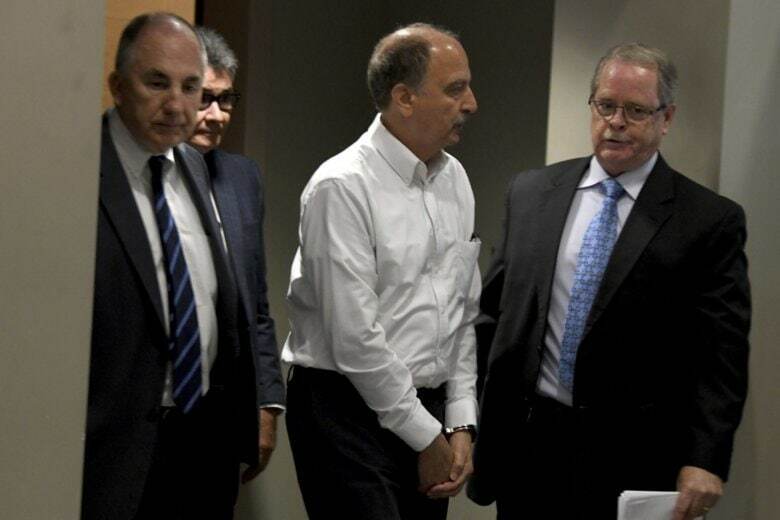 The library archivist, Gregory Priore, 61, and the bookstore owner, John Schulman, 54, were arrested on Friday on numerous criminal charges including theft and criminal conspiracy, the authorities said. They are accused of trafficking several hundred rare books, maps and other items worth more than $8 million in total, records show. More than $1 million worth of items, including the Newton volume, have been recovered. Even in the niche world of rare-book dealers, the value of the items stolen is stunning, said Michael Vinson, a dealer based in New Mexico who is a member of the Antiquarian Booksellers’ Association of America. “This is a huge deal,” Mr. Vinson said, noting that most rare-book dealers have annual sales between $500,000 and $1 million. Mr. Priore, the archivist, could not be reached for comment on Friday night. A lawyer representing him did not immediately respond to an email. Mr. Schulman did not respond to requests for comment. His lawyer, Robert G. Del Greco Jr., told The Pittsburgh Post-Gazette that his client was a “titan” in the book community. “The complaint sets forth serious allegations, and we are treating them as such,” he said. The partnership between Mr. Priore and Mr. Schulman began in the late 1990s, according to an affidavit filed by the Allegheny County District Attorney’s Office, which investigated the case. Mr. Priore told the authorities that he approached Mr. Schulman about selling some items in the library, but that Mr. Schulman later “goaded” him on. Mr. Priore was the sole archivist for the collection of rare books, maps and other items at the Carnegie Library of Pittsburgh, the city’s public library system. He oversaw about 30,000 items in the collection and controlled who had access to it, the affidavit said. Mr. Schulman and his wife own Caliban Book Shop, a block or so from the library, records show. He dealt in rare books, and was listed as a member of the Antiquarian Booksellers’ Association of America. Over the years, Mr. Priore told the authorities, he removed items from the library — sometimes he used an X-acto knife to remove a part of a book, and other times he simply carried out a whole book or map — and dropped them off at Caliban Book Shop on his way home from work. Mr. Schulman paid the archivist up front, records show, and then sold many of the items, including some to major book dealers.